Now this is the best DIY cooler project to do when you need a ‘new’ one already. Why? Because it has a lot more features than all the other outdoor coolers out there! 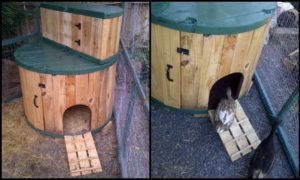 This DIY idea makes use of an old, non-working fridge and pallets, meaning it can be a very inexpensive project if you have free access to these materials. If not, try Craigslist and ask local pallet suppliers. That will surely still be easy on your pocket. ? 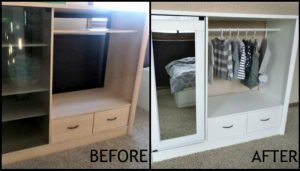 Though it seems like a big upcycling project, anyone can finish it even in just one weekend. You don’t need to be a professional, and you don’t need very special building tools and equipment for the entire process. What’s great about this DIY cooler is that you have the option to use the small compartment for little gatherings, or the large one for really big parties. The small cooler also works great for chilling some salad, fruits and other food, while you use the bigger compartment for all the drinks. If you’re not using the big compartment, you can use its lid as a counter for preparing food or as an extra table! And you don’t have to worry about cleaning the cooler afterwards. This tutorial also discusses how to provide good drainage for easy cleaning and maintenance. Just add wheel casters for easy moving anywhere in your backyard. Then add blackboard menu so that guests readily know what’s inside. 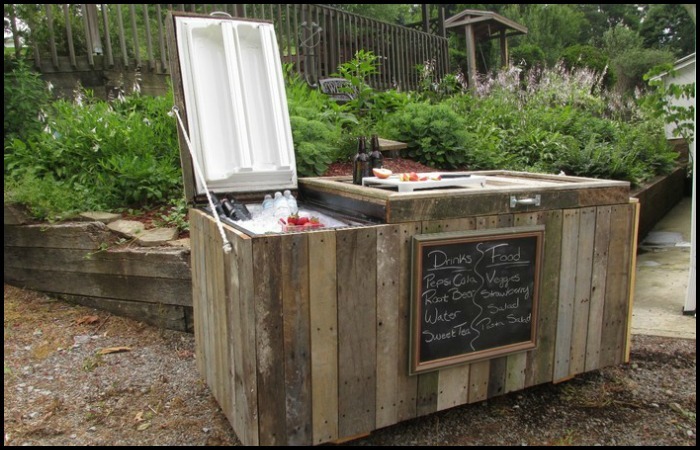 And there you have it, the perfect rustic outdoor cooler that is also a great conversation starter with guests! Hmm, do you think this cooler can get any more better? Breaking down the pallets can be a bit of a challenge considering how well they’re put together. The method that seems to work the best or me is to cut through the deck boards where they attach to the side stringer boards of the pallet. This leaves only the middle stringer and the deck boards attached and with a bit of leverage and some hammering you can easily separate the deck boards for use in your project. Once the pallets were dismantled, the next step was to process the deck boards so that they were 25.75″ long (the width of the refrigerator. To do this we assembled a quick jig for the cop saw that allowed us to index the boards to the correct length quickly so that all of the wood could be processed as efficiently as possible. We also left a few deck boards uncut so that they would be long enough to use for trim pieced in a later step. Dismantling the refrigerator is a pretty straight forward process, basically just take out the screws and most of the electronics and shelving pull right out. One very important thing to be aware of though is the Freon lines. It is illegal to cut Freon lines and allow the gas to escape into the atmosphere! Getting caught doing so will warrant a hefty fine, and more over, it’s just a bad idea as you’re polluting the air and the environment. In our situation the refrigerator we used was left in the basement of my sisters newly purchased house and the previous owners decided for some reason to cut the lines before leaving so we didn’t have to contend with Freon removal. Once you have the refrigerator stripped down you’re ready to start the next step: Painting! Previous PostGive old furniture pieces a new look with wood stain art! Next PostBuild a whimsical tool shed for your garden!